My name is Dennis Mutune - the owner of this site. I created this website out of the love and passion I have for my home Kenya, the African bush, wildlife and adventure. I am a Kenyan by birth and a full time resident of Kenya, a country that am really proud off. I am married to my lovely wife Eunice and we are blessed with one wonderful daughter Sherllyn and a son, Griffin - our pride and joy. I was born and raised on the outskirts of Nairobi. I am the second child in a family of three siblings. I came from a very humble background family and we were not well off financially. I faced many challenges growing up, but that did not detour me from pursuing my dreams. As a youngster I really loved so much about life. I enjoyed travelling and exploring new places in my country. I could not hold back my joy whenever we had a school trip, especially when we'd visit scenic areas and wildlife parks. After college I got a job with the government and I was posted to Machakos town which happens to be my home county. 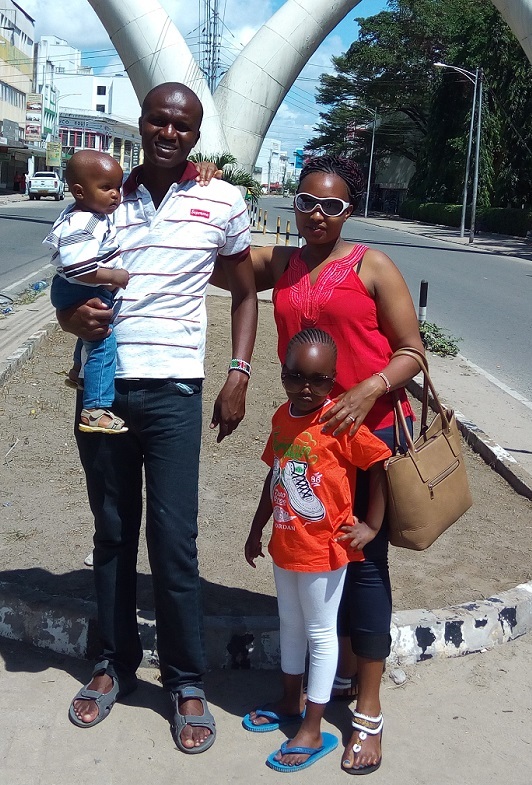 It’s here in Machakos town where I met my wife and we were blessed with two children. As a family man now, responsibilities grow. Being a civil servant in my county, which is still a developing county, means that remunerations are quite low and inflation quite high making life tough. I felt I needed more to make ends meet. I opened a small business to help me keep going but unfortunately it did not flourish as I expected. I was forced to close down the business when it could not meet its operational costs. Life was really passing me by fast, and this time round I felt I needed to do something that I love and have passion for - to change my life. Since I was a young boy my real love has been enjoying and exploring my Kenya. I even hoped one day I’d own a credible tour and travel company to turn my passion into a business. However there was one big stumbling block preventing me from achieving my dream. Capital! Capital to start such a business. My dream was about to become just a dream until one day I stumbled on SBI. This was my turning point. SBI bridged the gap and made me fulfill my dreams and live my passion. Now I am able to Share my Kenya with the world. Over the years I have come to learn and love so much about my homeland Kenya. Kenya is a beautiful country with amazing savanna, stunning beaches and lakes, eye-catching scenery like the Great Rift Valley, mountains, abundant wildlife and wonderful people. Kenyans have a rich culture and history, they are very welcoming and humble people. I personally come from the Kamba/Akamba community who are well known for their outstanding woodcarving and basketry skills. They are also known for their hospitality, which led to the colonial government establishing their first administrative capital at Ukambani land (Machakos town) in 1887 before they moved to Nairobi. We too have had our troubles in the past as a country. We have faced many challenges and some of them have been very heartbreaking and sad. We have been stricken by misfortunes but we have always found our way back and we soldier on even more determinedly. What characterizes us most as Kenyans? It’s our spirit to get back on our feet - to make Kenya a much better place. Indeed we are blessed and am proud of being a Kenyan “najivunia kuwa mkenya”. I am constantly exploring my country. I love the fact that I can always find something new and interesting and that I can share it with you, so that you too can discover unique places rarely visited by most tourists. I want you to be a part of my dreams and share my Kenya with me. In fact my greatest joy would be if you make my Kenya your Kenya too - even if you only visit for a short while I promise that Kenya will live in your heart and soul forever. So, as we say here, “Karibu Kenya” welcome to Kenya.